Photograph copyright Z V Vasovic. 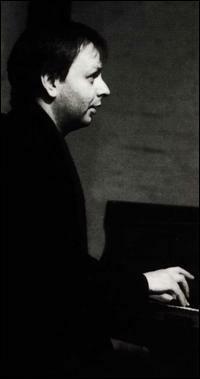 Born 1956, Bochum, Germany; piano, composer. One mp3 Georg Gräwe audio sample is available. After playing guitar in local rock bands since 1971, founded his first group, The Georg Gräwe Quintet, in 1974 while still in his teens. He has consequently been leading a variety of ensembles ranging from trio to chamber orchestra formats, which have involved some of the major soloists in contemporary musics. From 1982 to 1993 Gräew was director of the GrubenKlangOrchester, a 10-piece chamber group with an international line-up and from around 1989 he has also had a long-standing trio with Ernst Reijseger and Gerry Hemingway (which took a longish sabbatical in the late part of the 1990s, to re-convene for a tour of the US in 1999). His compositions, which include works for solo piano, chamber music as well as pieces for full symphony orchestra, have been performed at major venues in throughout the world. His work is documented on some 30 releases on several American and European labels. He has also performed and recorded with Anthony Braxton, John Tchicai, Barry Guy, Marilyn Crispell, Evan Parker, Barre Phillips, Ken Vandermark, Paul Lovens, Mats Gustafsson, Joëlle Léandre, Dave Douglas among many others. Current projects include The Georg Gräwe Quartet with Frank Gratkowski, Kent Kessler and Hamid Drake, TORQUE with Peter van Bergen and Melvyn Poore and a duo with Sebi Tramontana. Georg Gräwe runs the label Random Acoustics. A list of upcoming concerts is available. 1976, New movements, FMP 0320. 1977, Pink Pong, FMP 0480. 1978,	Who is who?,	FMP SAJ-23. The Berlin Jazz Workshop Orchestra. 1982, Bergmannsleben, CMP 0018. The GrubenKlangOrchester. 1984, Hanns Eisler, AufRuhr 670006. The GrubenKlangOrchester. 1987, Six studies for piano solo, WestWind 012. 1988/89, Songs and variations, Hat Art CD 6028. Recordings of the GrubenKlangOrchester. 1989, Sonic fiction, Hat Art CD 6043. Gräwe/Reijseger/Hemingway trio. 1990, Zwei naechte in Berlin, Sound Aspects 049. Gräwe/Reijseger/Hemingway trio. 1991, Piano duets (tuned and detuned pianos), Leo CD LR206/207. Duets with Marilyn Crispell. 1991,	Klangräume,	AufRuhr ART CD 001. 1991, The view from points west, Music & Arts, CD-820. Gräwe/Reijseger/Hemingway trio. 1991, Duo (Amsterdam) 1991, Okka disk 12018. Gräwe/Braxton duo. 1992, Flavours, fragments, ITM Classics 950014. The GrubenKlangOrchester. 1992, Spellings, RA001. Marvellous free music from Frisque Concordance. 1992, VicissEtudes, RA002. Frank Gratkowski/Georg Gräwe. 1993, Flex 27, RA007. Gräwe/Reijseger/Hemingway trio. 1994, Saturn cycle, Music & Arts CD 958. Gräwe/Reijseger/Hemingway trio. 1995, Concert San Francisco 1995 Gedächtnisspuren: 7 klavierstücke, Music & Arts CD 968. Solo. 1996, Live @ Banlieues Bleues, Red Toucan 9306-2. With Joëlle Léandre and François Houle. 1997, Melodie und rhythmus, Okka disk 12024. Georg Gräwe Quartet. 1998,	Schz!,	Splasc(h) CDH 670.2. Duo with Sebi Tramontana. 1998,	Light's view,	nuscope recordings 1004. Butcher/Graewe duo. 1998, Unity variations, Okka disk 12028. Duo with Evan Parker. 1999,	Other songs,	nuscope recordings 1008. Phillips/Graewe/van Bergen. 1999,	Counterfactuals,	nuscope recordings 1010. Graewe/Reijseger/Hemingway. 1999,	For trio (16 Fantasiestücke), FMR CD153-i0704. 2000,	Fantasiestücke I-XIII,	nuscope recordings 1014. Solo. 2001,	Arrears, Red Toucan RT 9320. Gratkowski/Graewe/Lindberg.